Heads up, Suja did NOT compensate me in any way for this post. I just love their smoothies and think their juices are reasonably priced. 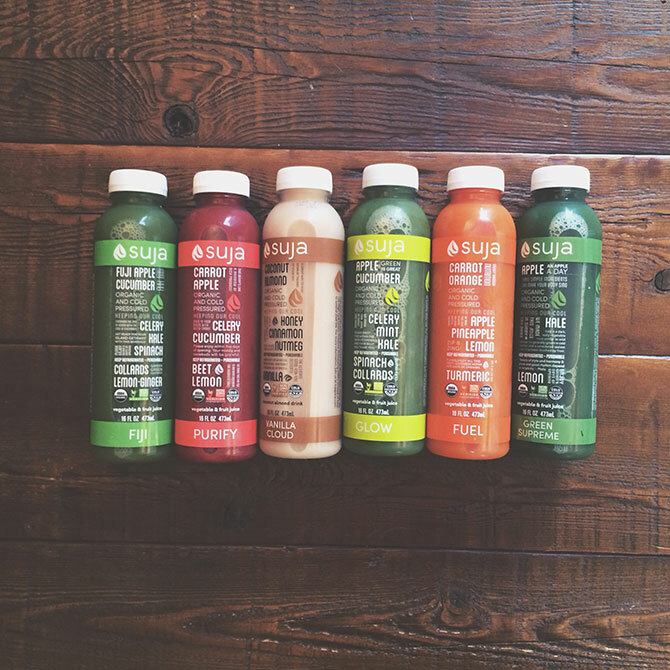 My one day Suja juice cleanse (Suja calls it the 1-day Fresh Start Program). I will say, it’s amazing I was able to make it through the full day. But I did it! I have literally never made it through a full day of juicing until this very moment. I was proud of myself! And not at all disappointed with the results. I decided to do a one day juice cleanse because I was feeling sluggish, bloated and gross. I don’t believe juicing can make you go from a size 10 to a size 2. And I don’t believe juicing will overhaul your entire lifestyle after one or two days. But, I do think it’s a good habit to get into–drinking a juice a day or occasionally resetting yourself with a cleanse. The morning of my juice cleanse, I ran to Whole Foods to pick up six Suja juices. I had looked at their website, and knew which ones I had to pick up and when to drink them. Overall, it cost me about $60. This was more than I thought I would spend, but I did throw a magazine into the mix…so let’s just say it was closer to about $50. I’m going to be honest, you are chugging veggies. And that’s not always easy. There were some times I had to plug my nose. But I knew that Vanilla Cloud (the final juice) was coming, and that helped (because I knew how delicious it was). This was probably my second least favorite. Lots of very raw green tasting veggies. This lasted me all morning because it took forever for me to drink. This one wasn’t bad. The carrot, apple and pineapple counteracted the extreme veggies and made for a sweeter juice. For some reason, the beet came through strong in this one. But I didn’t mind it. Possibly my least favorite one. Cucumber? Celery? Cilantro? Kale? Too much for me. In comparison to the FIJI, this one actually wasn’t that bad. The apple made it taste sweeter somehow. This one was my favorite, but I knew it would be. It’s like an almond, coconut milk type flavor. So delicious. Overall, the juices kept me full all day. I missed the texture of food, but I wasn’t starving. In fact, I was always behind in my drinking schedule. I was finishing “breakfast” by the time it was “lunch.” So I played catch-up all day. Not a bad thing. Kept me full and preoccupied. I also paired the juices with lemon water throughout the day, to further hydrate and clean out my system. After everything was said and done, I got the results I wanted. TMI, but it cleared out my colon. I peed constantly. Reduced my bloat SIGNIFICANTLY and I woke up the next day looking and feeling like myself again. I’d show you pictures, but I was so embarrassed about the “before” (when I was bloated) I deleted the picture without thinking, just because I didn’t want to look at it. But, to describe the before, it was like my stomach was carrying a food baby; just a little pouch around my middle. You know what I mean? After the cleanse, I woke up and my stomach was flat. Like, as flat as it usually is after a good night’s sleep and a heavy workout. Plus, I felt great! I would definitely do it again if I ever need a little reset or boost. I tried to do a three day one and did not make it but I think I could handle a one day cleanse! Yeah, I could never manage 3 days! I love food too much right now, haha. But I still felt a ton better after 1 day. And if you just want to clean out your system or reduce bloat, it definitely worked for me.